Barcelona: Barcelona pulled of a brilliant comeback by blowing away Sevilla 6-1 on Wednesday to book their place in the semi-finals of the Copa del Rey. 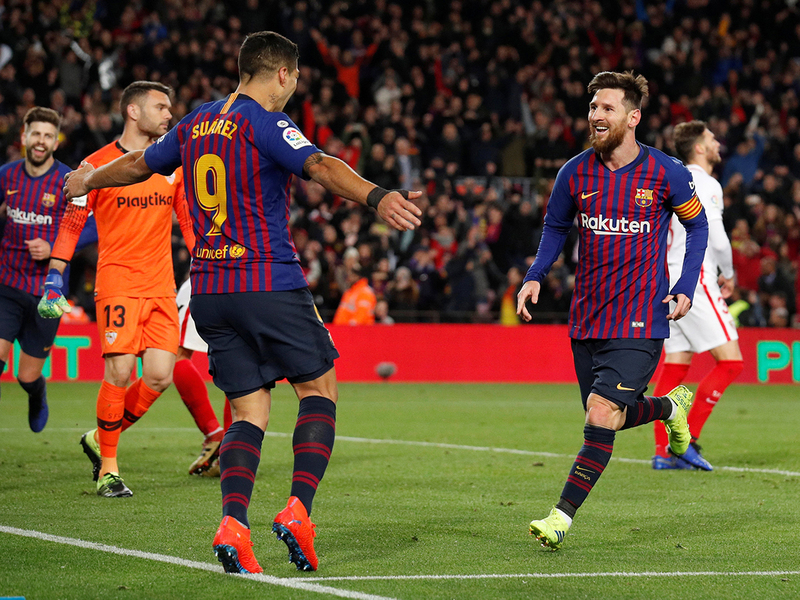 Sevilla had won the first leg 2-0 but their lead was wiped out within 31 minutes at the Camp Nou, after Philippe Coutinho scored a penalty, deferred to him by Lionel Messi, before Ivan Rakitic poked in a second. Coutinho’s form has wavered in recent weeks but his double could do wonders for confidence. Barcelona are no strangers to these sort of revivals but against Sevilla, who sit fourth in La Liga and have been one of their closest challengers this season, it was particularly impressive. They join Valencia and Real Betis in the last four. Betis had earlier needed extra time to beat Espanyol 3-1 and win 4-2 on aggregate while Valencia knocked out Getafe on Tuesday. Real Madrid will carry a 4-2 lead into their second leg against Girona on Thursday. Ernesto Valverde had rested players in the first leg but showed how seriously he takes this competition by fielding almost his strongest XI in the return. Messi, left out last week, was back in the starting line-up, along with Suarez, Jordi Alba and Coutinho. Jasper Cillessen kept his place in goal ahead of Marc-Andre ter Stegen. Perhaps Messi felt Coutinho had played a big part in winning the penalty after it was the Brazilian’s drag-back that gave him the ball. Messi went to shoot but struck the leg of Quincy Promes, who could do little about the contact. Referee Jose Sanchez checked with VAR and pointed to the spot. Messi gave way to Coutinho, who whipped it into the corner. The night could have been different had Cillessen not produced a pair of brilliant saves to preserve his team’s lead. First, he pushed Andre Silva’s flicked finish onto the post and then he saved Banega’s penalty, pushing it out after Gerard Pique had brought down Roque Mesa. It could have been 1-1 but four minutes later, it was 2-0, Arthur Melo picking out Rakitic, whose attempt to control turned into a poke past the committed Juan Soriano. Rakitic held up his hands, choosing not to celebrate against his former club. Barca appeared to have put the tie beyond doubt when they scored twice in as many minutes in the second half. Coutinho stooped low to head in Suarez’s cross and then Sergi Roberto hammered in after a delicate ball through from Messi. Instead, Sevilla pulled one back, Arana driving into the far corner. There were 23 minutes left and the visitors only needed one more to go through on away goals. But Suarez restored Barca’s ascendancy, tapping in Alba’s cross before Messi added a final flourish. Suarez played a swift one-two with Pique and his cross was helped on by Alba to Messi. Messi made it six.